This is yet another case where we’re reviewing a film based on a TV series we have not, as of writing, actually seen. Maybe it’s because we’re so damn lazy to even queue the thing up on Netflix or we’re just not really that bothered about watching it, but Jennifer Saunders’ long-running sitcom Absolutely Fabulous is one that we never got round to before seeing the long-in-development film version, and we strongly believe that in not doing so may have damaged our initial thoughts on the product. From what we do understand about the show, and it really is very little, two vapid and self-absorbed middle-aged women named Edina aka “Eddy” (Saunders) and Patsy (Joanna Lumley) are top PR agents in the fashion industry who are trying to live the good life for as long as they can. In the film, they are seeking to sign on Kate Moss – playing herself in one of oh-so-many cameos the film has to offer – who has left her firm, but an accident at a fashion party leads to Moss accidentally being sent overboard into the Thames, leaving both Eddy and Patsy at the centre of a media backlash. Desperate to escape, they flee to Cannes where they seek a more permanent rich lifestyle than back home. Again, as someone who has not seen the show (or simply is too lazy to even get around to watching it), we could fully understand why this property has gotten such a cult following over the years. More often than not, the film takes wide shots at the media industry and particularly its focus on celebrity statuses over more important news stories; for instance, while the Kate Moss scandal dominates television, a cameoing Jeremy Paxman is seen lamenting how nobody seems to care about the real problems of the world going on at the same time. There are clear attempts at satire going on, some of them proving to be rather clever and interesting, and Saunders’ script definitely knows what to make fun of even in some of its sillier moments. Saunders and Lumley, as the vain pair of protagonists, are a lot of fun together as they glide their way through one antic after another, with Lumley in particular – as a woman who within her morning routine injects enough botox into her face to withstand a few electrical volts – getting the lion(ness)’s share of one-liners and amusing situations, including a later scheme that involves cross-dressing as a man (although according to the film, her character is transgender anyway, so… make of that what you will). There’s also a whole bunch of supporting characters we assume are holdovers from the show, including Eddy’s constantly put-upon daughter Saffy and a PA by the name of Bubble who seems to have the most unusual fashion sense every time we see her. However, there’s quite a lot about the film that, despite not being dedicated viewers of the show, we just simply weren’t on board for. The pacing meanders about quite aimlessly for at least the first half, biding time with countless celebrity cameos including Gwendoline Christie, Jon Hamm, Stella McCartney, Graham Norton, Lily Cole, Rebel Wilson, and that’s just to name a few; and a lot of the humour will be hit-or-miss for any outsiders – we know this, because in our screening were a ton of people cackling away whenever something supposedly insignificant happens, probably because it’s a holdover joke from the show. That best sums up the whole experience of watching Absolutely Fabulous: The Movie; you will probably only enjoy it if you’re at all familiar with the characters and type of humour. For everyone else, it’s a tidal wave of “meh” – but then again, this film wasn’t made for us in the first place. 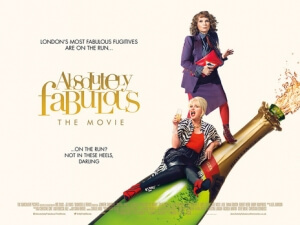 Absolutely Fabulous: The Movie won’t win over anyone who hasn’t watched the show it was based off of, but for what it is it’s a completely harmless detour that, while not without its faults as a film, works just fine.